Policarpo de Balzola was born on 26 January, 1813, in Irún, Basque Country, Spain. He was the third child of Miguel de Balzola Garamendi Emparanza y Arribalzagogesacoa from Guernica, a parish organist and choirmaster and María Josefa Iparraguirre from Irún, a cloth merchant (Policarpo had elder sister and brother—Antonia and Felipe). 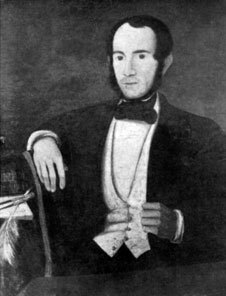 Miguel de Balzola Garamendi was born in Guernica about 1760. His father, Miguel de Balzola Emparanza (a great grandfather of the famous Spanish Basque composer Juan Crisóstomo Arriaga), was an organist and composer at the Church of Santa Maria de Guernica. Miguel Jr. succeeded his father's occupation and in January, 1780, he accepted the position of teaching organist and choirmaster in the Church of Santa Maria del Juncal in Irun. He worked as organist in Irun for 37 years, leaving in June, 1817, stricken with insult and paralysis. Miguel de Balzola died on 23 April, 1823. Policarpo de Balzola ended the elementary school in his hometown, where he was fond of arithmetic and geometry. After the death of his father in 1823, the family lead a poor life, so he had to work for his first revenues, in order pay some lessons that gave him a military engineer, who came to repair the fortifications of Irun, and presented to him some geometry, trigonometry and drawing for a few months. In early 1830s Policarpo went to Madrid to take charge of a model farm established in the vicinity of the Court, under the protection of State and remained there until he fell ill with pneumonia and was forced to abandon a climate that suited him so badly and to return to Irun in 1835. In 1837 he succeeded to get the position of a escribano (a notary) in Burgos, then he was appointed a Secretario del Ayuntamiento de Irún (secretary of the City of Irun) and worked (in various positions) for his hometown until 1868. From 1847 until 1850 he hold the position of perito agrimensor (expert surveyor) in Tolosa, a job that allowed him to draw plans of small and large construction projects. In 1860s Balzola designed Paseo de Colón (the Main Street) of Irun. After taking part in the First Carlist War (1833–1839), in which he actively participated as a member of the National Militia, in 1838 Policarpo de Balzola married Gabriela Echeverría y Ugalde from Irun, and they had four children: Isabel, Hermógenes, Valeriano and Soledad. In the 1840s, besides his calculating machine (see the calculating machine of Policarpo de Balzola), he invented a mechanical perpetual calendar (el calendario perpetuo mecanico) and got a patent (privilege) to sell it for 15 years, a measuring device for surfaces and a scoring mechanism. In 1849, Policarpo de Balzola went on to become a key figure for establishment of the metric system in the Spain and Basque Country. In 1853 he published a book (Aritmética con la explicación del Sistema métrico escrita por encargo de la Diputación de la M. N. y M. L. provincia de Guipúzcoa por Policarpo de Balzola) to spread the use of metric units. Besides this book, Balzola is the author of several other books for metric systems, universal harmony, calendars and others. Policarpo de Balzola was a politically controversial but affable and funny character with a sense of humour, good dancer, and his capacity for work and his passion for learning, always in favor of their community, still appear admirable. Policarpo de Balzola died on 1 February, 1879, at his home on the main street of Irun.